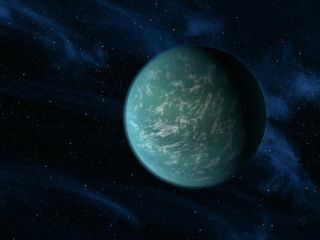 An artist's conception of Kepler-22b, a planet known to be in the habitable zone of a sun-like star. Kepler-22b is the first extra-solar planet, or exoplanet, that the Kepler Space Telescope found in the habitable zone of its star. It is thought to be a promising spot to search for life. But at 600 light-years away, further scrutiny of this world may require more powerful telescopes. Announced in 2011, Kepler-22b is estimated to be 2.4 times larger in diameter in Earth, with a comfortable average surface temperature of 72 degrees Fahrenheit (22 degrees Celsius). In the years since, however, investigators have debated how habitable the planet actually is. Kepler-22b is slightly larger than Earth, but has an orbit that is pretty similar (290 days to Earth's 365). Kepler-22b also orbits a G-star class sun like our sun, but the exoplanet's star is a little bit smaller and colder. Investigators praised the find as helping to fufill Kepler's mission of finding another Earth. "We're getting closer and closer to discovering the so-called 'Goldilocks planet,'" Pete Worden, director of NASA's Ames Research Center in Moffett Field, Calif., said during the press conference. The area around a star in which water can be liquid rather than ice is known as the habitable zone. Sometimes called the "Goldilocks zone," it's just right — not too hot (so the water doesn't evaporate) and not too cold (so it won't freeze). A Kepler team member also suggested that the planet, at more than double Earth's size, may not be able to host life on its surface. Instead, it could have an environment that is closer to Neptune: rocky core, large ocean. "It's not beyond the realm of possibility that life could exist in such an ocean," said Natalie Batalha, the Kepler deputy science chief, in an interview with the Associated Press. This diagram compares our solar system to the Kepler-22 system. The green area represents the habitable zone where water can exist in liquid form. Kepler-22's star is a bit smaller than our sun, so its habitable zone is slightly closer in. The orbit of Kepler-22b around its star takes 289 days and is about 85 percent as large as Earth's orbit. A few scientific papers have been produced since 2012 examining Kepler-22b in detail. A 2015 European Planetary Science Congress abstract looked at the variability in energy produced by Kepler-22b's host star, which would affect its habitability. That said, a search for an exomoon around Kepler-22b (published in the Astrophysical Journal in 2013) found no evidence of any moon in that system. However, the habitability of Kepler-22b is not necessarily a sure thing. It is only listed in an "optimstic sample" of potentially habitable planets at The Habitable Exoplanets Catalog (a project of the Planetary Habitability Laboratory of the University of Puerto Rico at Arecibo). The list includes planets that may not be rocky, may not include liquid water, or may orbit at the edge of the habitable zone. Kepler is still operational as of late 2017, but examining different areas of the sky because it is unable to point in one direction due to mechanical failures (the telescope is operating long past its expected lifetime). It has found many other potentially habitable worlds since Kepler-22b. Although the distance of these worlds makes it difficult to perform follow-ups, further work is possible using ground-based telescopes or future space observatories. Potential telescopes that could examine Kepler-22b include the James Webb Space Telescope (scheduled to launch in 2020) or the ground-based European Extremely Large Telescope or E-ELT; first light, or when the telescope first starts test observations, is targeted for 2024.